You always want to make sure that you have a backup of your critical data that you keep on your smartphone or tablet, and your contact list should be towards the top of your priority list when to comes to ensuring you have recent backup. If you use cloud-based synergy accounts for your contacts like Google Contacts, Facebook or Yahoo, you are probably less worried about having a backup since you can always go back to the source data and pull it down again. But if you use the Palm Profile or a different "local" account for your contact data, the only way to access your data is on the device itself. If that device gets lost or your backup gets corrupted, you run the risk of forever losing that data. There are a few methods that you have to back up your contracts, with the easiest being just dialing a simple code into the phone dialer to create a .vcf (VCard or "Virtual Business Card"). 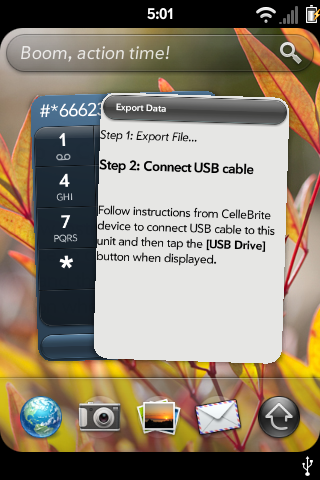 Once your device is in Developer mode, just plug it in to your computer. If you have the webOS SDK installed, you can directly open up a Linux Command Prompt, but an easy way to do that is to open up WebOS Quick Install and select "Tools" and then "Linux Commandline". Once the command prompt appears, type in the follow command, depending on your webOS version.